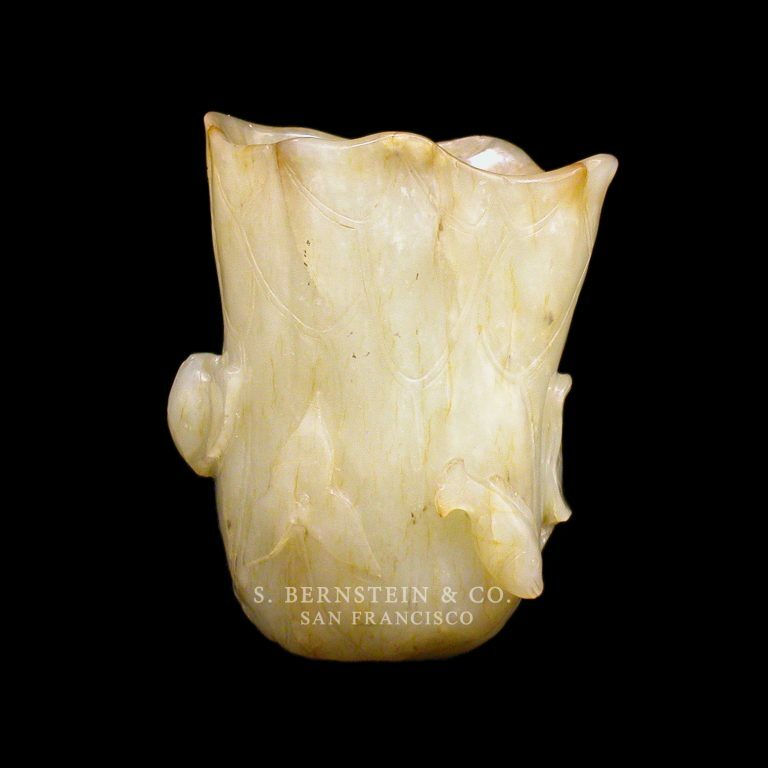 This elegant sculptural figure draws upon two popular Chinese motives, that of the lotus and of the fish. Traditionally, the lotus, symbolizing purity, has been an important symbol in the Buddhist faith, but the plant also serves medicinal, cosmetic and nutritive purposes. Here the artist has combined the familiar elements of the lotus and the fish, together with several small leaves to create a naturalistic scene. This graceful lotus brushwasher is of a tall cylindrical form, flaring slightly towards the mouth. The base follows the natural shape of the stone and is left in a round natural form. Several small fish figures and leaves decorate the outside of the vessel. Particular attention has been paid to the subtle veining of the lotus pad. In our opinion, the subject matter, material and workmanship indicate an eighteenth century date for this beautiful piece of scholar’s art. For an in depth discussion of art objects made for the Scholars Studio, see The Chinese Scholar’s Studio, Artistic Life in the Late Ming Dynasty by Li Chu-Tsing and James C.Y. Watt. Thames and Hudson, New York, 1987.